•	To identify the problems inside the joint e.g. torn cartilage, loose bodies, intra- articular fractures, tear of ligaments etc. •	Lavage: just washing the joint with normal saline produces relief of pain for a remarkable period. specially in mild to moderate types of osteo-arthritis of the knee joint. Mostly after clinical examination & X-Ray; MRI findings are very helpful in assessment of pathology. But it is important to mention that MRI findings can have a percentage of error. 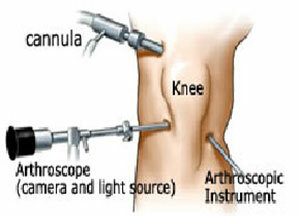 Arthroscopy is essentially a very low blood loss procedure and has very few complications. The underlying health of the patient is considered when determining who is a candidate for arthroscopy. Most importantly, the patient should be able tolerate the anesthesia that is used during the procedure. A person's heart, kidney, liver, and lung function should be adequate. If there are existing problems such as heart failure or emphysema, these should be optimized as possible prior to surgery. Patients who are on anticoagulants (blood thinners) should have these medications carefully adjusted prior to surgery. Other medical problems should also be controlled prior to surgery, such as diabetes and high blood pressure. Preoperative evaluation of a patient's health will generally include a physical examination, blood tests, and a urinalysis. Patients who have a history of heart or lung problems and generally anyone over the age of 50 will usually be asked to obtain an electrocardiogram (EKG) and a chest X-ray. Any signs of ongoing infection in the body usually postpones arthroscopy, unless it is being done for possible infection of the joint in question. The patient will check into the facility where the procedure is being performed and an intravenous line (IV) established in order to administer fluids and medication. The type of anesthesia used varies depending on the joint being examined and the medical health of the patient. Arthroscopy can be performed under a general anesthetic, a spinal or epidural anesthetic, a regional block (where only the extremity being examined is numbed), or even a local anesthetic. If a general anesthetic is not used, the patient is often sedated.After adequate anesthesia is achieved, the procedure can begin. 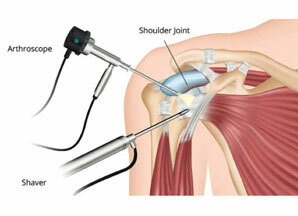 An incision is made on the side of the joint to be examined and the arthroscope is inserted into the incision. Other instruments are sometimes placed in another incision to help maneuver certain structures into the view of the arthroscope. In arthroscopic surgery, additional instruments for surgical repairs are inserted into the joint through additional small incisions in the joint. These instruments can be used to cut, remove, and suture (sew) damaged tissues. 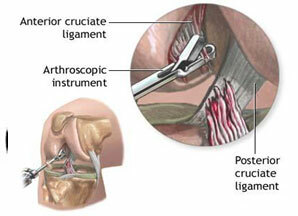 Once the procedure is completed, the arthroscope in removed and the incisions are sutured closed. A sterile dressing is placed over the incision and a brace or ACE wrap may be placed around the joint. •	Local anesthesia. Your knee may be numbed with pain medicine. You may also be given medicines that relax you. You will stay awake. •	Spinal anesthesia. This is also called regional anesthesia. The pain medicine is injected into a space in your spine. You will be awake but will not be able to feel anything below your waist. •	General anesthesia. You will be asleep and pain-free. •	Femoral nerve block. This is another type of regional anesthesia. The pain medicine is injected around the nerve in your groin. You will be asleep during the operation. This type of anesthesia will block out pain so that you need less general anesthesia. The surgeon will make two or three small cuts around your knee. Salt water (saline) will be pumped into your knee to inflate the knee. At the end of your surgery, the saline will be drained from your knee. The surgeon will close your cuts with sutures (stitches) and cover them with a dressing. Many surgeons take pictures of the procedure from the video monitor, You may be able to view these pictures after the operation so that you can see what was done. •	Torn meniscus. Meniscus is cartilage that cushions the space between the bones in the knee. Surgery is done to repair or remove it. •	Swollen (inflamed) or damaged lining of the joint. This lining is called the synovium. •	Kneecap (patella) that is out of position (misalignment). •	Removal of Baker's cyst. This is a swelling behind the knee that is filled with fluid. Sometimes the problem occurs when there is swelling and pain (inflammation) from other causes, like arthritis. Usually for small procedures like meniscal tears recovery is fest & 1 to 2 weeks are enough for ligament reconstructions ACL/PCL partial weight bearing walk 3 weeks & full weight bearing 6 weeks outcomes usually gratifying. 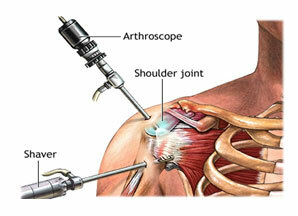 •	Inserts the arthroscope into your shoulder through a small incision. The scope is connected to a video monitor in the operating room. •	Inspects all the tissues of your shoulder joint and the area above the joint. These tissues include the cartilage, bones, tendons, and ligaments. •	Repairs any damaged tissues. To do this, your surgeon makes 1 to 3 more small incisions and inserts other instruments through them. A tear in a muscle, tendon, or cartilage is fixed. Any damaged tissue is removed. •	The edges of the tendon are brought together. The tendon is attached to the bone with sutures. •	Small rivets (called suture anchors) are often used to help attach the tendon to the bone. •	The anchors can be made of metal or plastic. They do not need to be removed after surgery. •	Damaged or inflamed tissue is cleaned out in the area above the shoulder joint. •	A ligament called the coracoacromial ligament may be cut. •	The underside of a bone called the acromion may be shaved. A bony growth (spur) on the underside of the acromion often causes impingement syndrome. The spur can cause inflammation and pain in your shoulder. •	If you have a torn labrum, the surgeon will repair it. The labrum is the cartilage that lines the rim of the shoulder joint. •	Ligaments that attach to this area will also be repaired. •	The Bankart lesion is a tear on the labrum in the lower part of the shoulder joint. •	A SLAP lesion involves the labrum and the ligament on the top part of the shoulder joint. Your surgeon may need to do mini open or open surgery if there is a lot of damage. Open surgery means you will have a large incision so that the surgeon can get directly to your bones and tissues. Preparation of surgery is generally like another surgery. Recovery can take 1 to 3 months. You will probably have to wear a sling for the first week. If you had a lot of repair done, you may have to wear the sling longer. You may take medicine to control your pain. Hip arthroscopy is not as commonly used procedure as knee & shoulder is initially used for the diagnosis of unexplained hip pain, but is now widely used in the treatment of conditions both in and outside the hip joint. The most common indication currently is for the treatment of femoroacetabular impingement (FAI) and its associated pathologies. Hip conditions that may be treated arthroscopically also includes labral tears, loose / foreign body removal, hip washout (for infection) or biopsy, chondral (cartilage) lesions, osteochondritis dissecans, ligamentum teres injuries (and reconstruction), Iliopsoas tendinopathy (or ‘snapping psoas’), trochanteric pain syndrome, snapping iliotibial band, osteoarthritis (controversial), sciatic nerve compression (piriformis syndrome), ischiofemoral impingement and direct assessment of hip replacement.